﻿ Best Price on Carinas Studio Apartments in Palm Beach + Reviews! 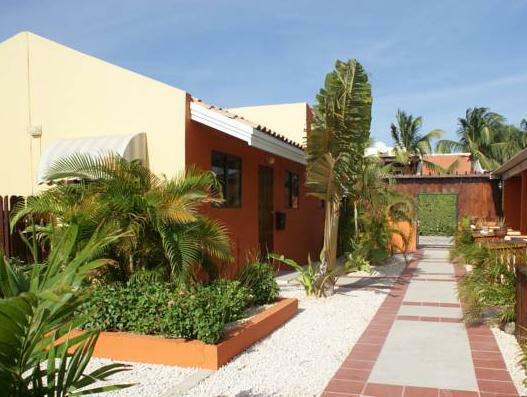 Cariñas Bungalow and Studio Apartments is ideally located in Palm Beach, Aruba, within a few minutes' walk of beaches, bars, restaurants and popular shops. Snorkeling, windsurfing, diving and sailing are all possible nearby. Cariñas offers air-conditioned studio apartments and a Caribbean-style bungalow, all with terraces and garden views. All accommodations has a private bathroom, a fully equipped kitchen, free WiFi and flat-screen cable TV. BBQ is available for guests to use. Free Tommy Bahama beach chairs, snorkel gear, luxury beach towels and a cooler are provided. Oranjestad, the capital of Aruba, is just 5 mi from Cariñas Bungalow and Studio Apartments, while Aruba International Airport is 6.2 mi away. Free on-site parking is provided.